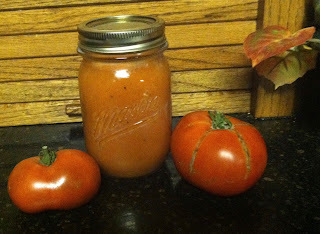 End-of-the-season Tomato Soup . . . processed, canned and ready for winter! This recipe came from a Kerr® Home Canning and Freezing Book, 1977 edition. Wash; cut up tomatoes (I also removed the core). Add to a large pot (12 quart+ capacity). Coarsely chop onions, celery, parsley; Add to pot along with the bay leaves. Cook until celery is tender (30 to 45 minutes). Put through a sieve or run though a food mill, return soup to pot and bring to a boil. Above: Cooked mixture going through the food mill. Below: Tomato mixture left after being put though the food mill. Above: Flour & butter rubbed together. Below: Tomato juice added to the flour & butter paste..
Add flour mixture to hot soup mixture; stir to blend. Continue to cook until soup has thickened. Add salt, sugar and pepper. Add other seasonings as desired. Fill cleaned and sterilized jars to within 1" of top. Add lids and bands (that have been heated).